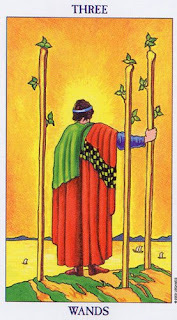 The card shows a figure turned away from the viewer, looking out over the distance to what might be the future. He is not fixated on the past, focussed instead on what lies ahead of him. 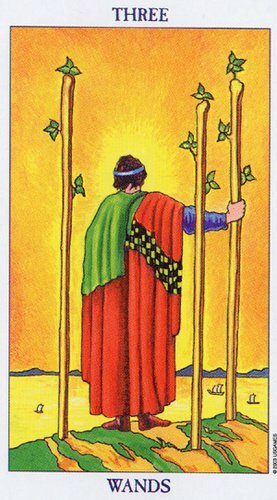 The three wands in the card is reminiscent of the three pillars of Freemasonry, the names of which are Doric, Ionic and Corinthian – alluding to wisdom, strength and beauty. According to W. Harland: These three pillars represent a trinity of Divine attributes. In the same way as the white light of the Sun is invisible until passed through a prism which decomposes it into seven constituent colors, of which three are primaries, so when "that Light which is from above" falls upon the prism of the human soul, the sevenfold properties then begin to manifest, and of these also three are primaries, called in the Craft system Wisdom, Strength, and Beauty. The significance of the three Pillars has a further intimate relationship with members of the Craft, which is seldom recognized. When a candidate submits himself to the Masonic rites, professedly entering them "by the help of God" and to seek the Light as "the predominant wish" of his heart, by that act the Supernal Light is solemnly invoked upon him and he becomes brought into organic relationship with spiritual powers. Not only does he enter the Craft in his temporal Lodge; he is spiritually incorporated with the Grand Lodge above, and, through the invisible hierarchy, with the Great Architect over all. He, as it were, "signs on" as a Fellowcraftsman in the Scheme of Divine Building, and becomes sealed as such. In a literally true sense he is "made a Mason," for a subtle change is wrought in his soul which does in fact make him spiritually different from those who have not been initiated. Indeed, a ray of that Supernal Light, whose rainbow elements are symbolized by the Pillars named Wisdom, Strength and Beauty, falls upon his soul; and it rests with himself to profit by the experience. The terms Wisdom, Strength, and Beauty, in their Hebrew originals, are the equivalents of what are otherwise translated from the Greek as "the Kingdom, the Power and the Glory." There is an old Masonic rhyme which declares: Who would a Master Mason be, Must always observe the Rule of Three." The real rule is concerned with the practical experience embodied in many mystery systems, which is intended to assist earnest seekers to a conscious knowledge of the realization of Wisdom, Strength, and Beauty, but this being a matter for personal reflection and observance it must be left to the student himself to interpret. These three pillars also represent the three stages of life: Youth, Adulthood and Old Age. By observing these three pillars in our lives we can reflect on the virtues of each stage placing us in a position where we are better prepared to consciously live life with wisdom and inner strength from the point and object of beauty – that is us. When we appreciate our own inner beauty and the beauty of all life around us we are able to live in appreciation. As we develop strength of character through life we immerse ourselves in grace as wisdom guides us from one step to the next. Knowing what to expect when we look forward we can prepare ourselves, we can examine and adopt these three attributes, using them to our advantage as we form and face the future.